I read this both because my book club assigned it for the month of April and also because I am a Hugo voter and got a free copy of it in the voting packet. I was familiar with Anders’ work, mostly essays and some short stories, and thought this book sounded really interesting from the description. It was a combination of magic and science, takes place in the SF Bay Area, about modern life with fantastical elements. Sign me up! But this book kind of dragged and also sped forward in ways that didn’t work for me. I like the early chapters a lot, when Patricia and Laurence, both outcasts in their school, meet and befriend each other. There is an early scene where Patricia learns she can talk to birds that I found charming and entertaining. Maybe Patricia is just a little crazy, or maybe she’s a witch. Laurence is a lonely boy who starts developing an AI that gradually grows sentient. They become friends because Laurence’s parents want him to start going into the outdoors and threaten him that if he doesn’t develop what their idea of a normal life is, they are going to send him to boarding school. Patricia has plenty of outdoor experience after her time of hanging out in the woods, so she talks to him about that. This book just gets a little more creatively ridiculous as time goes on, and I felt like there are a lot of elements that don’t really gel together. We are supposed to see Patricia and Laurence as star-crossed lovers or maybe opposing forces, but I found neither of them particularly sympathetic or relatable. 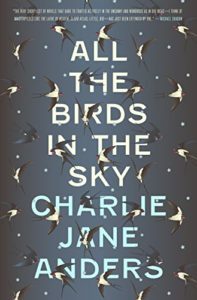 I feel like I missed the boat with this book, not sure why it was nominated for a Hugo, why it gets four stars on Amazon. I’d have a hard time recommending it to others. Share the post "Meh, At Least It’s Short!" I read this book and liked parts of it but found myself annoyed, too. It starts out like a fun and funny YA novel and then goes dark. And I felt like a couple of characters weren’t formed or used very well.